Thank you to all the wonderful volunteers for helping to launch the very first Community Outreach Vaccination Event in Marion. Task Force volunteers, Flathead Shelter Friends members and Flathead Shelter volunteers were all on hand to make it a great success. 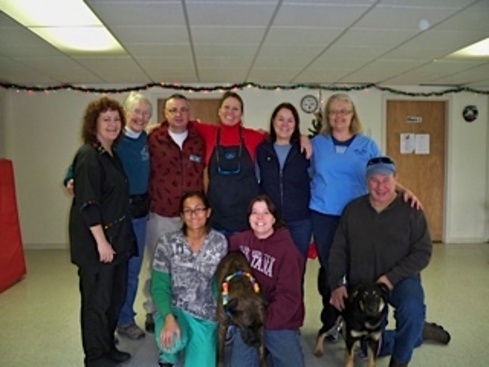 Sixty-one Rabies Vaccinations (40 dogs & 21 cats) were given, plus Sixteen Dog Vaccinations and Eleven Cat Vaccinations. Nine Flathead County Dog Licenses were sold and three dogs were microchipped. Lots of free pet supplies were given away that were donated by Marvin's Fund of Montana. A large quantity of pet food was given away. Food was donated by Animeals and Flathead County Animal Shelter. The Marion community was delightful. We received many thanks, lots of spay & neuter questions and people were gracious, generous to their less fortunate neighbors, patient and polite. They were also very glad to hear that we will be back next year! The Martin City vaccine clinic on December 3rd was also a huge success, thanks to all the wonderful volunteers and the great folks in Martin City.